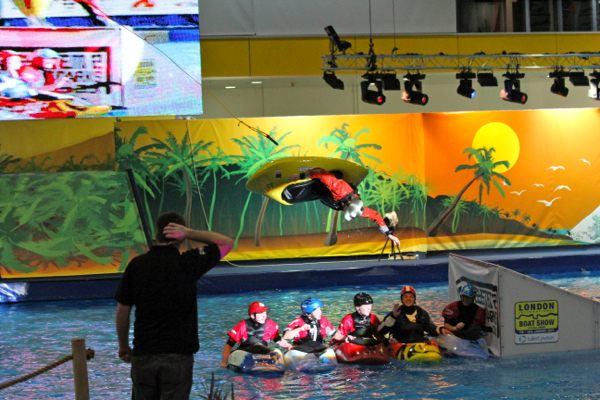 Late last year Rob Harris asked if I could come and be one of the kayakers to be part of the show team putting on daily displays at the London Boat Show. He said there’d be a wake board tow system with ramps, sliders, lighting, smoke machines & a huge TV screen so of course I jumped at the chance. The team consisted of myself, Bren Orton, James Benns, Ben Aldred, Stu Parry, Claire O’hara & Ed smith as commentator. Together with the organisers, lighting & sound team we put on hugely popular daily performances throughout the show that got the biggest cheers and applause out of any of the sports displays. Other demos at the pool were the kickass Wakeboard shows, Canoe Polo Champs, some SUP races and the opportunity to come and try various watersports including sailing, windsurfing, stand up paddle boarding and kayaking. It was a really great show to be at, so if you missed this one be sure to visit next year for an even greater display. A really great week and some very positive exposure of Freestyle to an audience that would never normally get to see this kind of action from Kayaking. A huge thanks to Rob Harris for organising the whole thing and the rest of the team for making it a good week. At the bottom of the page there is also great video by Bren Orton to give you a taste of what went on and a bunch of photos from the show. This entry was posted in Whitewater and tagged gbr team, james bebbington, katya kulkova, kayaking, london boat show, pringle. Bookmark the permalink.